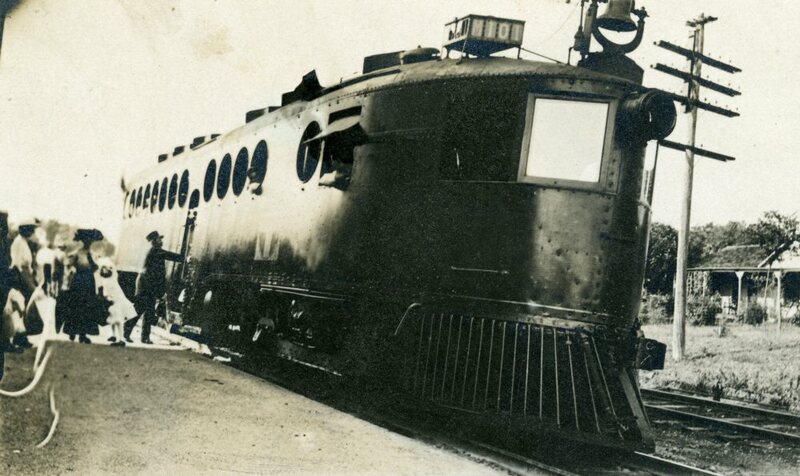 Santa Fe Railway | The McKeen Motor Car Website Santa Fe Railway | The Compendium of Knowledge on the McKeen Motor Car Company, and their experiments. This motor car is either the A.T.& S.F. #100 of #101. Notice how this motor car has a parabolic nose, or a nose that has a dull point in the front, rather than a pointed tip. Courtesy of the Donald Duke Collection. Another photo taken at the Factory. Postcard Courtesy of Madison Kirkman, M.M.C.C.H.S. 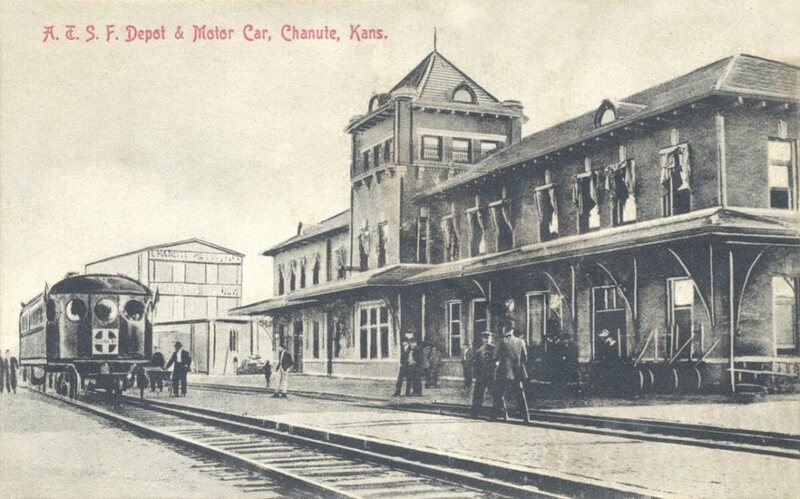 Santa Fe McKeen Car M-101 at Chanute, Kansas. 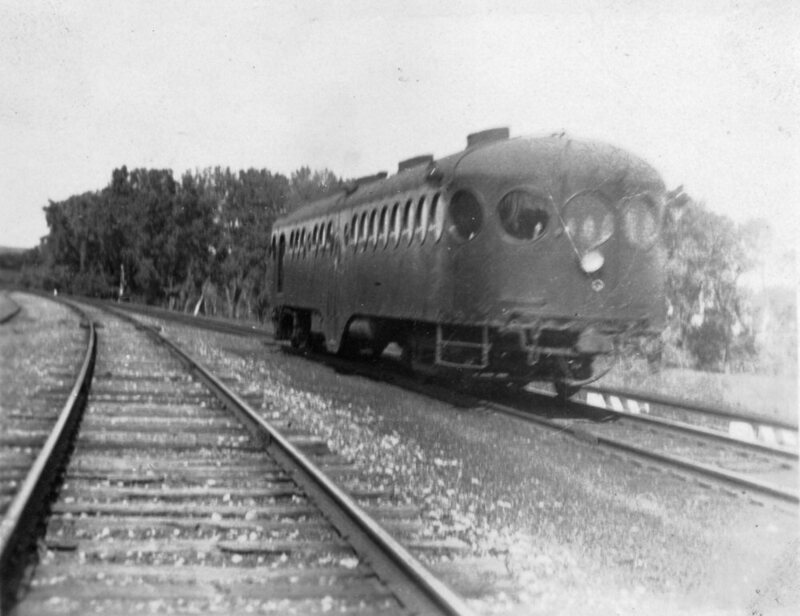 Photo of Santa Fe M-101 possibly at Wakarusa, Kansas, where the postcard was sent from, and was one of the stops for the motor car. 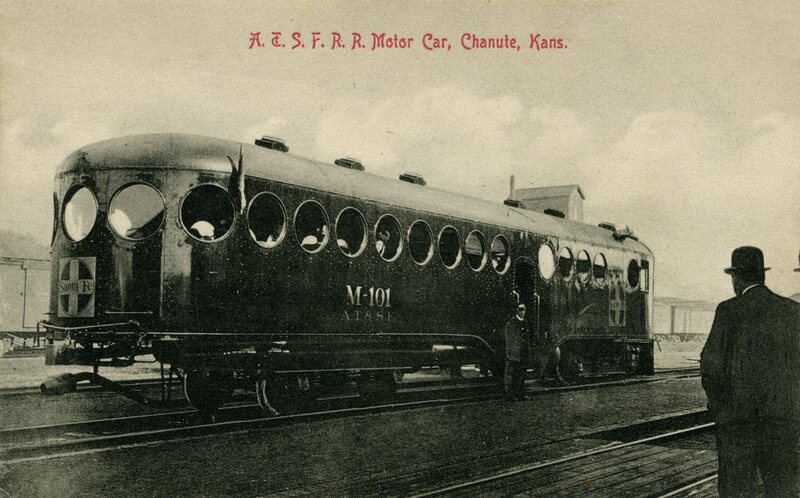 Santa Fe McKeen Car M-100 or M-101 at Chanute, Kansas. 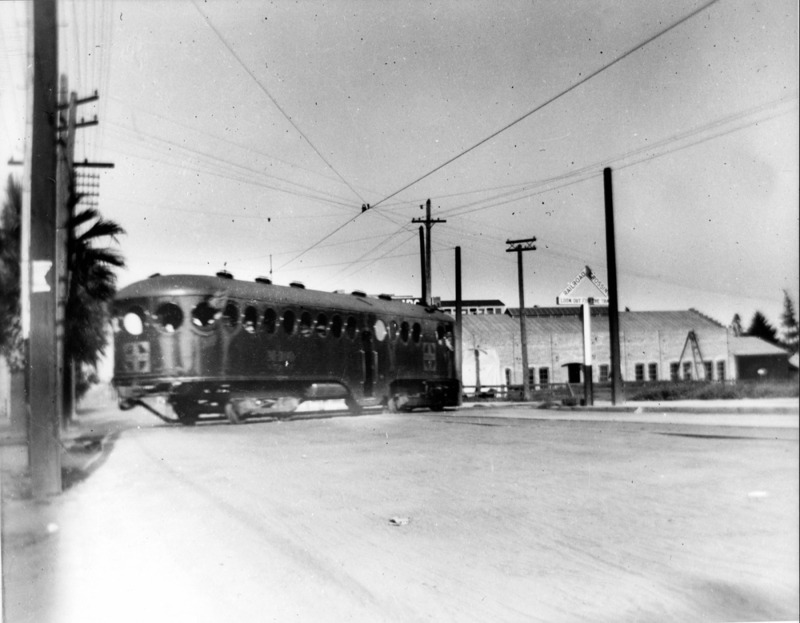 McKeen Car at 3rd Street, San Bernardino. Here is a photo of the Sante Fe M-102 that came with absolutely no information. The motor car (McKeen Car #M-103), which will be used in the new service installed by the Santa Fe between Emporia and Topeka, arrived today noon from Pittsburgh over the Chanute branch, and will be ready for the initial trip Monday morning. The car is handsomely painted in dark red, and created a sensation when It appeared. This motor car service is not a permanent arrangement, but will be tried for thirty days as an experiment. There seems to be no doubt in the minds of the railroad men that the venture will prove a success as it has done so wherever it has been tried, and as the situation between Emporia and Topeka is perticululy fitted for such service. While the thirty day experiment is tried, the car will make Sunday trips, although it is not decided whether this will be a permanent feature. During the thirty days there will be Sunday Ball in Topeka, and the service is arranged to accommodate the crowds for these events. The car will leave Emporia at the regular time in the morning, but the return trip will not start until 6 o’clock or later, in order to accommodate the fans of the intermediate towns. 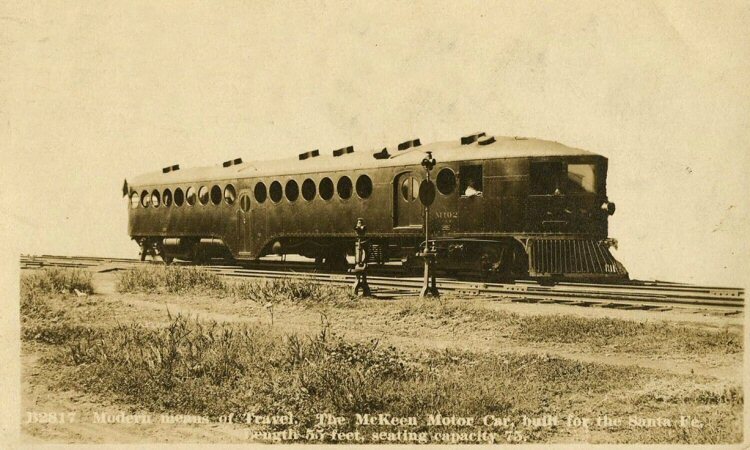 The car is one of the new McKeen gasoline motor cars. It is seventy feet long and weighs 60,000 pounds. The car is 200 horse power. The interior is fifty-eight feet long. The car is constructed entirely of steel and is totally fireproof. The front end is pointed in order to lessen the opposition of the wind. The rear end is rounded. It is divided into three compartments. In the front end is the room for the motorneer. The second compartment which is used as a smoking room will seat twenty men, the rear compartment will seat fifty. The entrance is through a side door, which leads into both the smoking and first-class compartments. The car Is entirely dust proof, being entirely of steel. The windows are oval shaped and open like the portholes on a steamship. The windows open on the inside and lift up on hinges, the fastening “being at the top. There will be no compartment for the handling of baggage on the motor car, but all hand baggage of course, can be carried. There would be but little need of heavy baggage handled on the train, as it will be used primarily for shopping. The car, if necessary, has power enough to carry an extra coach as a trailer. This will enable all the crowds to be cared for and in case of events of unusual interest. such as the county fair and The like. Additional accommodations can be given the public. Three men will form the train crew. There will a motorneer who will have the running of the car. A conductor will collect the fares, and a brakeman will be carried to assist in handling the car. It will be will be his duty to help passengers on and off the and perform the duties which usually fall to this position. Travel on this car will posses many features which the regular service does not. The numerous windows and the openings in the front end will afford more than the usual amount of ventilation. The car is large and airy and will be fully as comfortable as the regular passenger coach. The seats are not crowded but are far enough apart to afford plenty of room. They are constructed of cane. Leave Emporia. . . . . . . . . . .7:30 a. m.
Emporia Junction. . . . . . . . . 7:35 a. m.
Lang. . . . . . . . . . . . . . . . . .7:49 a. m.
Reading. . . . . . . . . . . . . . . .8:06 a. m.
Barclay. . . . . . . . . . . . . . . .8:19 a. m.
Osage City. . . . . . . . . . . . . 8:31 a. m.
Peterton. . . . . . . . . . . . . . .8:37 a. m.
Burlingame. . . . . . . . . . . . .8:48 a. m.
Scranton. . . . . . . . . . . . . . 9:00 a. m.
Carbondale. . . . . . . . . . . . .9:08 a. m.
Wakarusa. . . . . . . . . . . . . .9:18 a. m.
Pauline. . . . . . . . . . . . . . . .9:30 a. m.
Arrive Topeka. . . . . . . . . . .9:45 a. m.
Leave Topeka. . . . . . . . . . .5:00 p. m.
Pauline. . . . . . . . . . . . . . . .5:15 p. m.
Wakarusa. . . . . . . . . . . . . .5:25 p. m.
Carbondale. . . . . . . . . . . . .5:35 p. m.
Scranton. . . . . . . . . . . . . . 5:43 p. m.
Burlingame. . . . . . . . . . . . 5:53 p. m.
Peterton. . . . . . . . . . . . . . 6:01 p. m.
Osage City. . . . . . . . . . . . .6:09 p. m.
Barclay. . . . . . . . . . . . . . . 6:20 p. m.
Reading. . . . . . . . . . . . . . .6:35 p. m.
Lang. . . . . . . . . . . . . . . . .6:54 p. m.
Emporia Junction. . . . . . . .7:10 p. m.
Arrive Emporia. . . . . . . . . 7:15 p. m.
AT&SF 70′ McKeen Car At Lamar, Colorado.